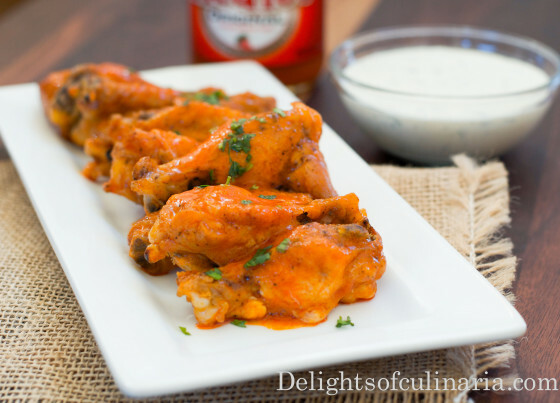 As we all know buffalo wings are a popular game day party food.And no need to take out or to buy some in the freezer section of your grocery store,because….they are so easy to make at home,much healthier and so tasty.These are baked until the skin is nice and crispy then tossed with Franks hot sauce. Simple ingredients,easy method,and amazing finger licking results. Season wings with more salt and black pepper. Arrange on a cooling rack. Place cooling rack on top of rimmed baking sheet. Bake for 25- 30 minutes one side,then another 20-30 minutes the other side or until skin is golden in color. Heat sauce and butter in a small sauce pan until butter is melted. Place wings in a bowl and toss with sauce.Let rest for about 3 minutes and toss again. Oh yeah my kids love them too.Thanks!